Leishmania (Mundinia) orientalis is a recently described new species that causes leishmaniasis in Thailand. To facilitate characterization of this new species, an in vitro culture system to generate L. orientalis axenic amastigotes was developed. In vitro culture conditions of the axenic culture-derived amastigotes were optimized by manipulation of temperature and pH. Four criteria were used to evaluate the resulting L. orientalis axenic amastigotes, i.e., morphology, zymographic analysis of nucleases, cyclic transformation, and infectivity to the human monocytic cell line (THP-1) cells. 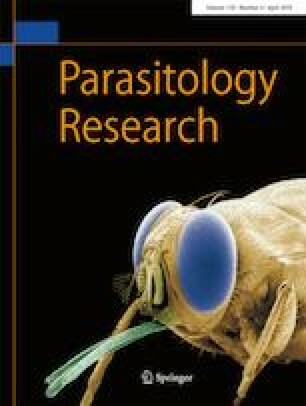 Results revealed that the best culture condition for L. orientalis axenic amastigotes was Grace’s insect medium supplemented with FCS 20%, 2% human urine, 1% BME vitamins, and 25 μg/ml gentamicin sulfate, pH 5.5 at 35 °C. For promastigotes, the condition was M199 medium, 10% FCS supplemented with 2% human urine, 1% BME vitamins, and 25 μg/ml gentamicin sulfate, pH 6.8 at 26 °C. Morphological characterization revealed six main stages of the parasites including amastigotes, procyclic promastigotes, nectomonad promastigotes, leptomonad promastigotes, metacyclic promastigotes, and paramastigotes. Also, changes in morphology during the cycle were accompanied by changes in zymographic profiles of nucleases. The developmental cycle of L. orientalis in vitro was complete in 12 days using both culture systems. The infectivity to THP-1 macrophages and intracellular growth of the axenic amastigotes was similar to that of THP-1 derived intracellular amastigotes. These results confirmed the successful axenic cultivation of L. orientalis amastigotes. The axenic amastigotes and promastigotes can be used for further study on infection in permissive vectors and animals. We thank Assoc. Prof. Dr. Sirida Yangshim of the Department of Microbiology, Faculty of Medicine, Chiang Mai University for the human monocytic cell line. NJ and PAB conceived and designed study. WC and MDB performed research. NJ, PS, and WC analyzed data. NJ, WC, and PAB wrote the paper. All authors read and approved the final version of the manuscript. This work was supported by the Thailand Research Fund through the Royal Golden Jubilee Ph.D. Program (grant number: PHD/0065/2556 to NJ for WC), the Faculty of Medicine Endowment Fund (grant number: 024/2558 to NJ), and the Diamond Research Grant (grant number: PAR-2560-04663 to NJ), Faculty of Medicine, Chiang Mai University. In addition, the Chiang Mai University provided the budget for our Excellence Center in Insect Vector Study (grant number: 2562 to NJ).